Every nation wanted to be close to the United States. India is not an exception. From the day one of the independence, Jawaharlal Nehru desired to gain proximity to U.S.A. Luckily it ignored the moves of the charismatic Prime Minister of the new born nation. The erstwhile Soviet Union grabbed the opportunity to extent its golden hand to become its strategic partner. The relationship continues even today despite its break up and lost relevance. After Nehru gone, there were no strong moves on the part of the Indian state towards U.S.A. Indira Gandhi infuriated the top establishment of U.S.A by her high decibel voice against the American supremacy and her overt support to the Soviet Union. In order to thwart the American attempts to set up a naval base in the Indian Ocean in Trincomalee in the east coast of Sri Lanka to threaten India, Indira Gandhi offered arms and ammunitions to the LTTE. While this was given clandestinely, open support was offered to Sri Lanka to stop Americans intruding through the sea With the collapse of Soviet Union and the exit of J.R.Jaywardane from the Lanka’s presidency, different developments occurred. Rajiv Gandhi entered into an agreement with the Sri Lankan government to prevail upon the war mongering LTTE. Cleverly the J.R.Jaywardane government twisted Indian army and LTTE to fight it out the battle. The Sri Lankan army was watching the fight between the LTTE and the Indian army. Americans lost interest in the Indian Ocean after the end of Cold war. Then the neo liberal Prime Minister P.V.Narshimha Rao rekindled interest in getting close to the power corridors of America. But the U.S.A ignored it to prove its historical mindset. The 9/11 episode exposed U.S.A’s vulnerability to the global network of terror groups. For the first time the Frankstein monster created by United States – Osama Bin Laden and his cohorts wreaked havoc in the heart of the New York City. By ambushing aircraft into the twin towers which showcased the power of America to the world was reduced to rubbles. When the Americans were preparing for an all out attack against the bombers, the NDA government led by Vajpayee offered unconditional and unsolicited support. This included war planes landing facility and fuel refilling in the Indian territory. Even in that hour of crisis and credibility loss, the Americans choose to accept the Pakistani hospitality and assistance in chasing the Osama’s army rather than the voluntary help of India. The Congress party invoked the slogan non alignment to oppose the appeasement policy of the Vajpayee regime. Both inside the parliament and outside, Sonia Gandhi led Congress establishment revolted against the pro American stand of the government. They gave a new twist to the strategic partnership emerging among America, Israel and India. The question of anti-Muslims attitude of these three countries came handy to the opposition Congress. At the backdrop of Godhra violence, Congress used the American shift of NDA to have a good catchment in the minority vote bank. The Left parties joined by regional forces like Samjajwadi Party opposed the new American turn of the Indian government to capitalize for the vote share increase. In this background, what is the relevance of opposition towards the Indo-US Civil Nuclear deal which is popularly referred as 123 agreement? It is certain that no political party in India does like to deviate from the US appeasement policy when take the seat of power at the centre. Whether the high decibel Left or non alignment drum beating Congress party or the Swadesh rhetoric mongering BJP all are in the game to nullify the efforts of indigenous science and technology in the long run. It was the beggarly treatment meted out to Indians by United States which forced the latter to develop its technology on its own. If the Indian establishment is proud of its scientific achievements today it is because of its compulsions forced by US all these years. Ignoring this fact and entering into slavery signing ceremony in the name of civil nuclear cooperation is nothing but high grade ridiculousness. Efforts were in full swing to get the stamp of U.S.A to announce to the world India is a nuclear power. Is it not a kiddish behavior of the Indian government to seek the approval of the Americans? Anyway there is Pakistan to checkmate India’s growing nuclear clout. For every nuclear explosion New Delhi conducts there is an immediate bomb response from Islamabad. 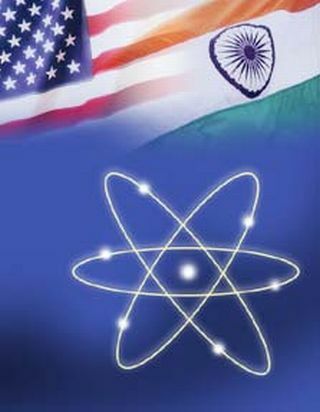 How does it matter if the U.S.A and other developed countries did not recognize India as the nuclear power? North Korea and Iran are positioning strategically well without getting anyone’s stamp. A crucial benefit which the 123 agreement declares is the continuous supply of Uranium for the power plants in India. Why should the poor country import Uranium when it can tap its own Thorium for the same purpose? In the olden days, the clever Britishers smuggled Thorium from the shores of Kerala in the name of coir import. Now the vast amount of Thorium resources lying across the country can be used for the nuclear power plants to generate electricity. This can save $150 billion which the American companies are eyeing through its technology transfer and Uranium export to India in next twenty years. More importantly the dependence on Americans for Uranium and its control over the nuclear power generation will discourage the Indian scientific fraternity. Instead of breaking the chains to innovate and technologise new methods for power generation the Indian nuclear scientists will be forced to relax. The future will deprive the best Indian brains to come up with the technological breakthroughs in the civilian nuclear technology. Now the USA agreed to offer nuclear cooperation not because of the Indian government efforts but due to the clout wielded by the Indian diaspora there. The democrats and republicans are playing the traditional Indian vote bank politics. Another crucial reason for the Americans to give green signal for the deal is to checkmate the growing popularity of China. Whatever causes may be for the inking of 123 agreement, India should not lose its painstakingly built indigenous talents in science and technology.